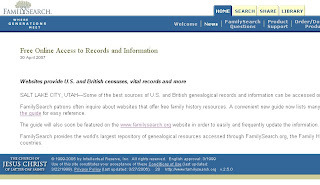 On April 30th, FamilySearch announced that they have developed a guide for websites that offer free access. The PDF document includes website links for US and UK research. Please note that some of the website addresses on this PDF file, do not work and others like the information about Ancestry.com being free in the SLC Family History Library are incorrect. I will check each of the links on this document and review the sites that operational in future blogs. This document will eventually be placed on the FamilySearch site in order to keep the information updated. If you would like to read the news release click here and you will be redirected to this news release. The document is in PDF format and can be easily downloaded for your use. If you do not have Adobe Reader click here and you will be directed to the Free Adobe Reader site to download the program and install on your computer. Just follow the directions that Adobe has at this link for installation directions.